GB v Fiji 11:40am Koonung Reserve, Bulleen curtain raiser to the 2pm Manningham v Dragons (VAFA) match. Great Britain will be hardened by their match against Nauru and should show out as the more experienced side here. Margin won't be huge though and if Fiji can get a run on then anything could happen. France v Indonesia 12:00pm Diggers Rest Reserve, Diggers Rest followed by the 2pm Digger’s Rest v Rupertswood (RDFL). France barely scored aginst Ireland but showed they can use the ball and link up. They should have an easy win here but the Indonesians could score multiple goals. PNG v South Africa 12pm St Mary's Oval, Geelong followed by the 2.10pm St Mary’s v North Shore (GFL). What a battle of beautiful footy this should be. PNG will run away with this one though and their harder bodies will prevail. Tonga v Japan 12:50pm Elgar Park, Box Hill North followed by the 2pm Box Hill North v Hawthorn (VAFA). Japan should not be underestimated here, although Tonga will be hard at the man and the ball we expect the Japanese to stick to a disciplined game plan and running hard in numbers to sneak home with a win. India v Pakistan 4pm Highgate Recreation Reserve, Craigieburn following the 1pm Richmond v Essendon (VFL) match. Playing in front of both Richmond and Essendon that are clubs embracing the Indian community in Australia we will back in the Indians here with superior fitness and experience. New Zealand v USA 12:30pm Montrose Recreation Reserve, Montrose followed by the 2.30pm Montrose v Blackburn (EFL) match. The US will definitely be the underdogs here but we have seen them defend well and work well around the ball, if their forward line can fire NZ could be beaten. We expect the US to throw everything at the Kiwis here as it is do or die for them - and that sort of attitude can be dangerous. Canada v Sweden 11:45am Ben Kavanagh Reserve, Mordialloc played before the 2.30pm Mordialloc v Skye (VWFL) match. Canatda will be smarting from their close defeat to the US on Wednesday and if they can straighten up their kicking they should overcome Sweden. China v Finland 11:10am Eureka Stadium, Ballarat curtain raiser to the 2pm North Ballart v Williamstown (VFL) match. Both teams will be eager to notch their first win and we think it should be China. Forward line of both teams an unknown quantity at this stage but China have looked the more competent at linking up chains of possession so far. 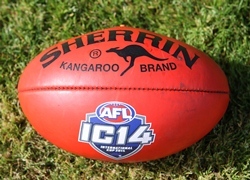 Ireland v USA Liberty 2pm Plenty Park, Plenty following the 12pm Diamond Creek v Melbourne Uni (VWFL) match. Banshees to win this one easily. USA Freedom v Tonga 4:30pm Kings Park Reserve, St Albans following the 2pm VU Albans v Darebin (VWFL) match . Expect Tonga to continue to improve but the Freedom by 4-5 goals. Canada N Lights v Fiji 10am Mulgrave Reserve, Wheelers Hill before the 12pm Eastern Devils v Cranbourne (VWFL) game. Northern Lights in a big win here. Some close games there probably. I'll go against you on a few. Japan over Tonga? Hmm, I reckon the Tongans might be too good. India over Pakistan? I thought maybe the reverse. US will test NZ but it would still be a huge upset to roll them. I'll conservatively stick with the Kiwis. China over Finland? That would be a huge result for China, hard to call as both have been obliterated so far, but I'm sticking with the Finns.